TapinRadio is simple, fairly reliable and works most of the time. Plenty of stations to choose from and continuously updated. Supports most of the internet radio formats ? mp3, wma, ogg, aac. Quick search. Graphic Equalizer. Scheduled recordings. Record what you are listening to ? as separate tracks or continuously. Automatic checking for software and station listing (only if configured in settings). Show your favorites in groups. Alarm feature. Sleep timer to shutdown TapinRadio or even your computer! Pocket Radio Player is a free Shoutcast and IceCast compatible internet radio player for Windows. Unlike the many other players out there, this software concentrates on offering basic functionality in a compact package. The radio stations listed in the PRP database are handpicked and updated regularly, which takes a lot of time. For this reason unreliable stations are deleted frequently. PRP offers a decent variety of free radio stations. It never aimed at competing with commercial services or apps that try to impress by numbers. Online TV Live lets you watch 3645+ free Internet TV, on demand videos and listen free online radio stations on your PC, Games and Newspapers ( +1250) on World Wide Web. Media Guide: 250 Full Movies, 1540 Movies trailers, +2500 Music Videos (Free and legal) you can see or download. Our live Television channels database is the biggest worldwide. No additional equipment required. Online TV Player support Windows Media Player and Real Player. You can play most of stream formats in this program. This software enables you to set the screen window to any size you want, also supporting full-screen mode. Program for viewing online internet TV channels and recording it into AVI (Xvid, DivX, etc.) , viewing and recording streams from TV tuner and camera. Network streaming.. This software allows you to watch 400 paid online internet TV channels TOTALLY FREE (including SPORT, NEWS, ENTERTAIMENT, MOVIES, REALITY, LIFESTYLE, SHOPPING, MUSIC, KIDS, GAMES ... ) and 1200+ free live television channels from 100+ countries. 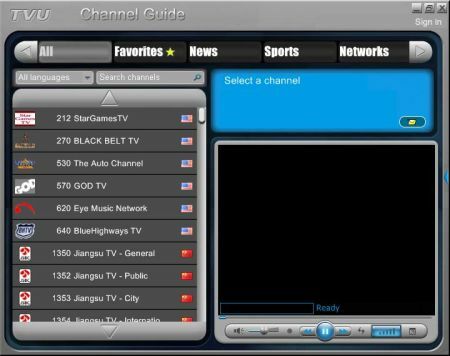 There is NO NEED for additional software installed and NO NEED a TV Tuner card because all the channels are streamed through your Internet connection. For most TV a modem speed of 56Kb/s is required, for the broadband TV stations you need 100 Kb/s. Software comes with automatic TV station updates so it will never be out of date. Watch local TV, world TV, Live TV, satellite TV from countries of all world in different languages on your PC with anyTV not just at home, but at the OFFICE , work or wireless. Watch 2630+ Online TV, 6910+ Video clips. Listen to 4750+ Online Radio. Using anyTV means you can watch numerous of international TVs without a television, TV Tuner Card or a satellite receiver. Watch anywhere you have your internet Online. No additional equipments required. Internet TV player and radio tuner for Russian users. Tune in on your favorite radio! Keep up with the news, local and international, and discover new trends and new artists on more than 5200 stations worldwide. With allRadio you may keep in touch with your favorite local radio or listen to more than 35 musical genres ? worldwide! Jazz, Latino, Rock, Electronic, Dance, Opera, School, HipHop, R&B? USA, UK, Germany, Italy, Netherlands, France, Spain, Canada, Africa, Asia, Russia? With a simple transmitter any car trip might be changed into a journey of discovery. You are looking forward to an exotic ambiance, in your own home, just plug your iPhone or iPod to your HiFi system. Free software for listening to Internet Radio. It is possible to record the selected channel radio to mp3 file, folder "XRadio_sound" with the recorded files automatically created in the same where you run the program "Xstar Radio". The program Readon TV Movie Radio Player allows you to listen to radio, watch TV broadcasts and access to latest movies on the internet. All you need is a Windows PC and an Internet connection. There is no need for a PC TV card because the TV channels are streamed through your internet connection. This is probably the best and yet free internet TV and radio you can get. TVUPlayer is program that enables viewers to watch high quality live Television programs around the world. TVU networks brings you programs from around the world that you can't get from your local cable and satellite providers. Include the Sci Fi Channel, Spike TV, Fox News, ABC, NBC, CBS, The CW, several of the Chinese CCTV channels as well as many others. RadioClicker Lite is a Internet Radio product. 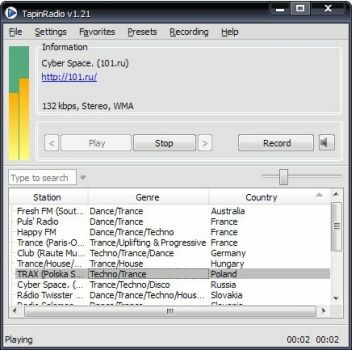 Internet radio RadioClicker can listen to radio on your computer through the Internet. Using RadioClicker can watch Russian online TV. In RadioClicker collected nearly all radio and television stations broadcast in Russian free of charge via the Internet. From the list of programs you can see the station, such as: "Russian Radio", "Radio Shanson", "Radio Europe +", "Nashe Radio, Radio Hit FM, Radio City FM, Radio Echo of Moscow", "Radio 7 on the seven hills "," Radio Maximum "," Radio Record , Radio D-FM , Radio Retro FM "," Radio NRJ , Silver rain "," Radio Villa "," First Channel "," RTR-Planeta "," TV Mir TV, "TV News", "RBC TV," TV News New Event "and others. BooRadio is the simple and convenient Internet radio and TV player, allowing to listen on the computer to the radio Internet absolutely free of charge. The player does not demand installation - simply enough to download it and to start (portable). If the program on is started, establish install Microsoft .NET Framework 2.0. Fur-tree of project BooRadio - to create ideal (the idle time convenient, compact, easy) Internet radio receiver. Any interested person can add the favourite station in playlists BooRadio: simply enough to leave the information on it in the guest book, and all users BooRadio can listen to this station. Crystal TV is a live TV on your PC, Mac, iPad, iPhone, and iPod Touch. 25+ LIVE channels of Russian TV. Built-in TV guide. Matrix view. Picture-in-Picture. Crystal TV automatically adapts to current internet bandwidth and always displays the best picture independently of your current location!